it's most likely i won't be able to get away to deliver my cookies, much less hang out and enjoy the soups as i'm getting a new furnace installed wednesday afternoon. it was originally supposed to be installed thursday, but it's making terribly loud noises and is dying a little every day. i decided it couldnt wait as it's too noisy to sleep through it and it's going to be cold again on wednesday. this is all my way of asking if anyone could stop by my place in logan square to pick up my boxes of cookies on their way to the hideout? if yes, please PM me and i'll be forever grateful. Joan--sorry you won't be able to join us but please keep us posted and let us know if you have someone set to pick up your cookies. I have a super busy day on Wed. so not sure I'll have time to go over to LS but if no one else offers, I'll figure out a way. And updating the soup list--my contribution will be a French-style pork stew. Still need one more soup chef--hoping someone will step forward to join us!! boudreaulicious wrote: Joan--sorry you won't be able to join us but please keep us posted and let us know if you have someone set to pick up your cookies. I have a super busy day on Wed. so not sure I'll have time to go over to LS but if no one else offers, I'll figure out a way. Hi Jen, as a first timer, I just want to confirm. Your post says crock pots will be provided, as will ladles? Soup makers just need to be there between 5 & 5:15 with Warm Soup and accoutrements, correct? kalamazoogal wrote: Hi Jen, as a first timer, I just want to confirm. Your post says crock pots will be provided, as will ladles? Soup makers just need to be there between 5 & 5:15 with Warm Soup and accoutrements, correct? You've got it! Just bring your soup in whatever container you wish--they provide the crock pots which will be turned on to heat up when we arrive a bit before 5:00. They also provide ladles. See you there and thanks for contributing!! According to the forecast, it appears we'll be back to (non-extreme) soup weather on Wednesday night. Really looking forward to the event and seeing everyone there! Taking the day off to make soup tomorrow! Apologies for last minute switch, my soup is morphing into cheesy sausage chowder. Thanks all! Looking forward to it as well! Thanks for the updates on the soups—I’ll edit the 1st post now. 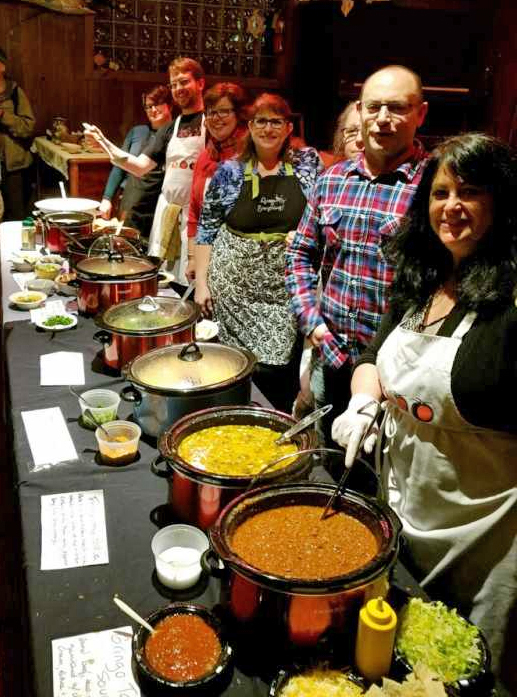 Also, laikom is doing a “meat lover’s pizza” soup and I’m going to do an additional gringo taco soup, since we never got an 8th volunteer. Hope lots of LTH folks, friends and family will be joining us! boudreaulicious wrote: Also, laikom is doing a “meat lover’s pizza” soup and I’m going to do an additional gringo taco soup, since we never got an 8th volunteer. My Meat Lovers Pizza Soup is basically "Cream of Meat" soup, with a pizza sauce topping, oregano and crushed red pepper shakers. I did the stock from pork neck, and parmesan rind, dumped a couple packages of cheese in there as well for good measure. For the meats, I'll be tossing in last minute: pepperoni, spicy italian sausage, hamburger, ham, and bacon crumble. Should be a really rich soup! Hope someone baked some plain pizza crust to go with it. I'm going to try and squeeze in a dessert to bring today too! I made raspberry shortbread bars too. Thanks so much everyone--both of my soups are done as well. I'll update the list for the additional desserts--they sound completely delicious!! I'm also bringing a dessert. I got a Dozen Donuts from Dinkles. Realized it will be GF as well as vegan! I believe the technical term for the amount of cookies you baked is a fuckload. Joan's cookies -- along with our paltry 3-dozen -- are in hand, and our ETA is 5:15.
i aim to please....and thanks again for picking up the cookies, ronnie. A great night of soup and breaking bread together! I enjoyed every bowl! Sorry I couldn't stay longer. Nice work, chefs. kalamazoogal wrote: A great night of soup and breaking bread together! Thanks boudreaulicious for getting this organized and thanks to everyone for the soup contributions - a delicious and really varied selection of soups. And the desserts were terrific too. And thanks to those who didn't cook/bake for coming out and supporting the cause. The money you chose to donate goes to food pantries and organizations that feed the hungry so not only do you get a great dinner but you support a great cause - warm feelings all around. I was really not in the mood to cook this past weekend -- just been too busy -- but I was glad I did and this is always such a fun evening and a great chance to interact with a lot of people I don't often get to see. Until next year . . . Thanks to all who cooked/baked/ ate/donated/and ORGANIZED! Great to have fun for a good cause! irisarbor wrote: Thanks to all who cooked/baked/ ate/donated/and ORGANIZED! Damn - those were some tasty soups and desserts last night! Thanks to all who contributed by cooking, baking, attending, eating and donating. And a special shout-out to Jen, who did triple duty . . . organizing the event and making not 1 but 2 soups! ronnie_suburban wrote: Damn - those were some tasty soups and desserts last night! Thanks to all who contributed by cooking, baking, attending, eating and donating. And a special shout-out to Jen, who did triple duty . . . organizing the event and making not 1 but 2 soups! Thank you all for the thanks--it was a TERRIFIC effort this year--everything was sooooo delicious, even Matt's crazy meat soup which, I admit, I was a little scared to eat but was strangely addictive. GREAT stuff!! Just wanted to add that we raised $666.00 (not kidding ). "Our" group was North Side Housing and Supportive Services, but S&B is changing up the format and pooling all money raised, then dividing it equally for all of the participating organizations at the end of the season. Good change, I think, since it doesn't penalize groups who through the luck of the draw or bad weather, get a lighter or less generous turnout.